Someone doesn’t know her own strength. No, she explicitly stated she was forced to assume a normal, non-powered form and not a differently-powered form. That’s why she wants to reclaim powers via that shop. Anyone else wonder if her lack of powers might actually be psychological? I mean, a shapeshifter who physically lost her powers because she was forced to turn into a form that wasn’t a shapeshifter seems like an attempt to divide by zero (and yes, I recognize that in a comic-book themed universe, there probably are individuals who *can* divide by zero). That’s even better than what I said. 🙂 Nice! I forget which issue that’s from. 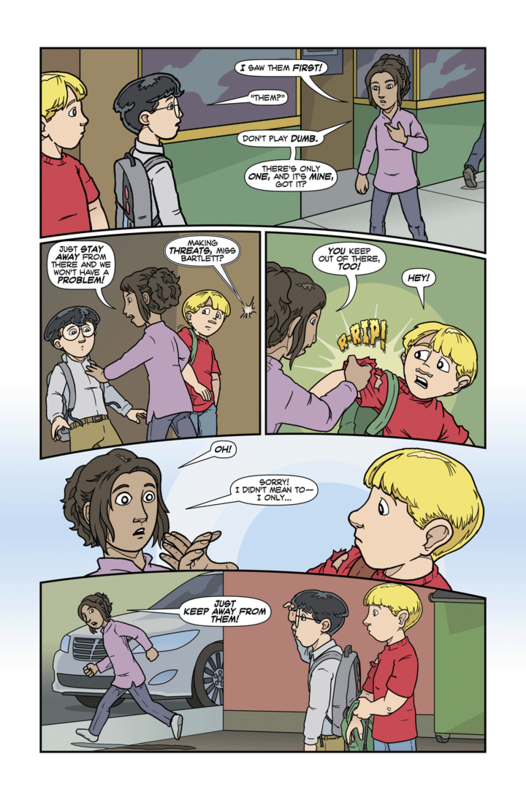 Issue 36, Malphast and the Mysterious Meh (comic for 03142012 in the web archives). In Calculus we have a way of handling dividing by 0. 0/0 = anything (What times 0 gives you 0?) A mathematical tool called a limit lets us figure out which 0/0 we are working with. For any other numerator, k/0 = positive or negative infinity. Again, the limit can help us determine which infinity is involved. To lose something so precious because of being mind-controlled (to put it mildly)… even with a child, I’m almost surprised this was as far as she was willing to go. One of the things I love with this comic (used to collect the physical copies, it’s so good)… character development at its finest. Who is speaking in panel 2? I think we find out in the next update! Isn’t it obviously Cecil, while cloaked? She hears a voice, but seeing no-one on that side but Tyler, thinks that he is speaking up, and turns on him. “Cloaked” Really wish there were a way to edit one’s own remarks. It’s Cecil. The funny text balloons due to his toy voice distorter appeared in the previous page. What we have here is an art error/text/balloon error here. It may not be an error. The voice distorter works great to protect Cecil’s identity while he’s invisible, but a distorted voice coming out of nowhere is kinda noticeable when you’re not expecting an invisible person. Maybe Cecil’s not using it specifically so that Sarah will mistake his words for Tyler’s. Don’t know why he’d draw attention to Tyler that way though. Or Cecil forgot to turn on the distorter. Yup, it appears to have been fixed. I’d say not. I can’t see Cecil saying “Miss Bartlett”. To me, its likely Dr. Newby. Then why would Sarah turn on Tyler? Or, if it’s Dr. Newby, why say “Making threats?” when she could tell her to calm down. That line is less fitting of Dr. Newby than Cecil addressing someone by their surname. And when does Dr. Newby have a cloaking device or have Vashti cast invisibility spells on her just so she can snoop on her patients? That quite invasive or privacy, something a doctor would be aware of. There’s no evidence the speaker is invisible. Simply off-camera. The evidence that the speaker is invisible is that Sarah turns on Tyler when she hears the voice rather than responding to any putative visible off-screen character. What Owlmirror said. If she was visible and simply off-camera, why would she grab Tyler’s shirt sleeve so hard to the point of tearing? That’s the same as punching an innocent bystander after the person next to them insulted you. It only makes sense if she mistook Tyler for having said “Making threats, Miss Bartlett?”, and that only makes sense if the person was unseen. That’s besides someone cloaked already talking to Ron and Tyler in the previous page. If she isn’t actually someone from their school, Cecil might not know her first name, and is referring to her by the name used at the groups therapy meeting. There is also the possibility that is the way Cecil refers to every one while acting as a “professional” Secret Agent. Everyone in the group introduced themselves with their full names. I’m going with your latter idea: Cecil uses the more formal mode of address because that’s how he thinks agents — secret or not — usually talk. Really? “Miss” and then a last name sounds exactly like what Cecil would do for someone he isn’t friends with, because that’s exactly what the government agents and MiB on TV would do. Most likely Tyler, given that they all introduced themselves to each other in the group therapy session, Sarah shouldn’t mistake Cecil’s voice with Tyler’s. If Tyler wanted to plant a tracking device (or listening device) on Sarah, calling her by her last name would be a good way to antagonize her, which would lead her to grab the sleeve of his arm closest to her. Except, Tyler’s in the shot and the word balloon isn’t coming from him. I agree with Cecil, not disguising his voice. Looks like commenter FractalFire from the last page nailed it. And it also looks like my hunch that Paula was the customer of Power & Glory has been disproved. I’m confused about the line “There’s only one”, though. Is that really part of their schtick? Or maybe that was the specific deal they cut with Sarah, because what she brought (and/or bartered) wasn’t enough for a permanent transfer of the maguffin she got? Or maybe there’s a specific limitation on her specific maguffin? Oh, well. I guess all will eventually be revealed. I’m guessing there’s only one of what SHE wants, and she assumes everyone else is after it too. She probably didn’t have enough money to get it this time, so she’s trying to run off the “competition”. I think you’re right. Sarah doesn’t have the artifact she’s seeking yet. However, I don’t think Power and Glory are after money: more likely Sarah has to perform a series of tasks or obtain another item for the duo. Still, it surprises me that Sarah is the client; considering she’s only a bit taller than Tyler (who’s still in elementary school), which means Power and Glory must be tiny. Although looking back, the position of the door handle should have been a clue. Adahn, I just want to go back to your “agents of Order and Chaos” theory. I said that instead of cherubs and imps or angels and demons, Glory and Power may be mortals but backed up by Order and Chaos. (Not likely, but I thought I’d throw this in for fun. I’d say not order and chaos, but rather just chaos. There is a 0% chance that handing out devices that grant enormous power to those that greatly desire it will lead to order. Isn’t her tearing of Tyler’s shirt, not knowing her own strength, a hint that she does in fact have the maguffin from P&G? My guess: his shirt is made to tear in that location; Tyler uses the tearing of his shirt to distract Sarah so that he could put a tracking device on her. Darn. Another sharp speculation, Adahn. I like. 🙂 I really like the idea/sight of Tyler becoming more and more night-walking vigilante detective savvy. At first, I interpreted that as her pushing past him to get to Ron, with his other hand simply being at his side, however looking at panel one, Ron was actually closer to her. So yeah, that could work. Thought on the “There’s only one” — the store might be full of potential destiny items — gauntlets and capes and the like — but there’s only one item that can restore an individual’s prior power set, which she values the most (and which she would have reason to think Ron would covet). She’s trying to reclaim powers via the shop, she thinks due to Ron’s story that he’s competition as she’s now suffering from paranoia due to not handling the loss of her powers well at all. She sees Tyler as a possible threat as well given the nature of his parents and thinking he might go there to acquire powers too, since she doesn’t know that he’s practically allergic to super-empowering methods (he lost a chunk of his memory just trying to read some magic text once). Well she’s on her way to becoming a villain, her desperate need to reclaim her powers or any powers at all has left her paranoid. Not too surprising though, she’s someone who basically had part of her body amputated leaving her crippled and she’ll do almost anything to feel whole again. Some people like Ron are born with a backup set of powers, while she has to make a Faustian bargain to obtain even a simulacrum of her former self. Even if Sarah knew that Ron hasn’t made a similar deal with Power and Glory for the artifact, I don’t think she would take it well. It made no sense to me that Sarah says “there’s only one”, because we see that P&G’s shop is stocked to the rafters with various objects, which may be magic or weapons (as Power confusingly states), and we know that Sarah knows that. Except that I see on scrolling back that Glory says that “it depends on what you want”. Why would Sarah think that Ron (or Tyler) would want the exact thing that she wants, given that there’s so many different options? Sigh. Maybe Sarah is confused. Eh, as long as I’m speculating. . .
You’re reading too much into his shirt tearing, you do not need super-strength to tear clothing particularly along a seam, nor do we have any reason to think Tyler’s clothing is super-durable to require super-strength to damage. If it were she’d have ended up probably injuring Tyler from yanking him into her since he’s hardly braced where she could tear his shirt like that with super-strength and not yank him into her at the same time AND fail to tear it to boot. It’s just a garden variety situation with her tearing his shirt meant to illustrate the depths of her mania to acquire new powers and the lack of self-control it’s causing her. ah… aaron must read the chats, notice he fixed the speech bubble in panel two.